Having just performed at the MOBO awards and now straight onto her UK tour RAY BLK was ready to perform at Band On The Wall and vibe with her fans. “How you feeling Manchester…this is my first time doing my own show here I’m so happy.” She said excitedly, her fans eager for her performance. The 23-year-old Nigerian-Londoner was supported by 19-year-old pop-soul artist Kara Marni; who warmed up the room with her smooth vocals and energy. She performed some of her original songs, as well as her hit single ‘Golden’, and a cover of Childish Gambino’s ‘Redbone’. The audience were so excited for RAY as many people kept looking at the back of the stage waiting for her arrival. When she came on stage (on the dot at her required time) screams of “I love you RAY” could be heard. RAY opened her performance with songs ‘Westside’, ‘Baby Girls’, and ‘Talk To Me’, her rawness and confidence could be felt live straight away. She also performed a cover of Beyonce’s ‘Say My Name’. Putting her stamp on the song with her smooth vocals, and energetic and sultry dance moves; her backing singers also joined her to dance and sing for the cover. The beat from the drums started and the audience reaction was amazing as they cheered knowing that the R&B/ Soul singer was performing one of her hit songs ‘Patience’. ‘Durt’ is the song she performed next, most known as she self-released a mini-album called ‘Durt’ back in 2016, which received national success and recognition. Another song the crowd loved was ‘Chill Out’. When RAY sang ‘Chill Out’, people were on the balcony level of the venue passionately singing and throwing their hands out to vibe with RAY. ‘Girl Like Me’ was a song that she performed that she said everyone should sing to their ex. Her personality shone through performances of tracks like this and ‘Hunny’, the audience connecting with every word she sang. “My songs are about empowerment… who is an independent woman… who is an independent man?”. She performed ‘Empress’ and ‘Doing Me’ and the crowd became even more hyped, it was clear that everyone felt empowered & uplifted by RAY’s performance. RAY was accompanied by two fantastic backing singers who at two points in the show joined her to dance on stage. The band were also breath-taking; helping RAY to bring the room alive. 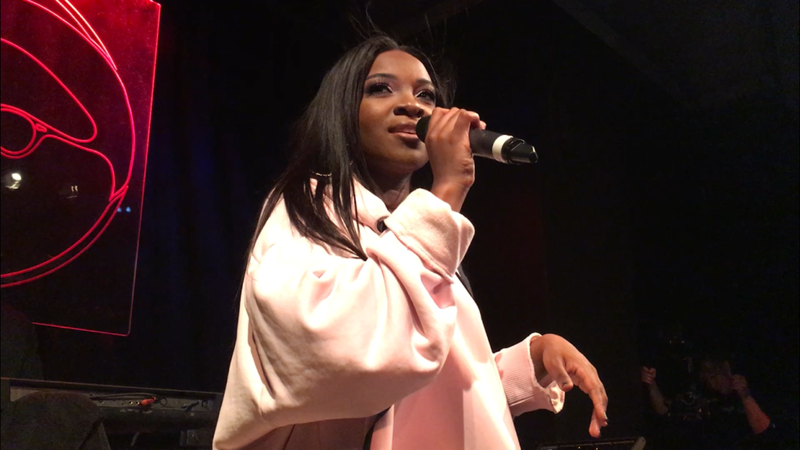 To finish her sold-out gig RAY performed her hit single (which features Stormzy) ‘My Hood’. She connected with the crowd, singing with them, holding their hands and engaging every person in the room. RAY BLK’s performance at her Manchester show was not only exceptional but magical too. Her stage presence is one that artists would inspire to have and fans love. RAY BLK is an artist you should most definitely see live; She created a vibe with her contagious energy and stunning vocals that made the gig more like a party than a concert. Next ArticleFilthy Gears chats about working with Wiley, CapoLee, C Cane & many others to Maya Dasilva!! Him being record of the week, his upcoming projects and him being in the lime light! !